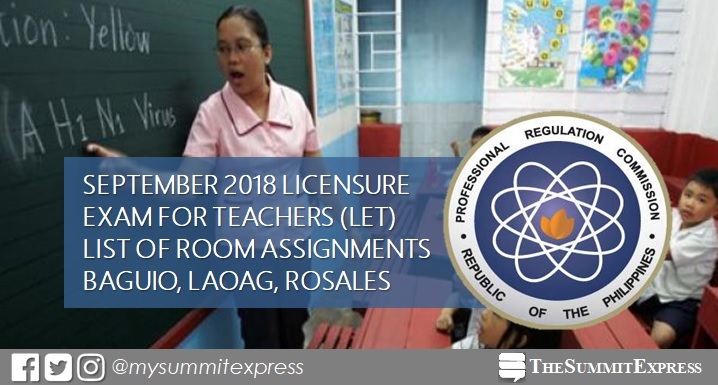 MANILA, Philippines – The Professional Regulation Commission (PRC) Baguio Regional Office released the list of room assignment and guidelines for September 30, 2018 licensure exam for teachers (LET) or teachers board exam. Testing centers for September 2018 LET to be handled by PRC Baguio include Baguio, Laoag and Rosales. As advised, room assignment will be posted online starting September 17. "All other qualified examinees will be posted as soon as their date of graduation is verified by their school," PRC Baguio said. "In case an examinee name is not included, misspelled, or there is discrepancy in date of birth or school and campus in the List of Examinees, call telephone no. (074) 661-9105 / 0910-9638887 or email prcbaguio.application@gmail.com," PRC Baguio added. Aside from Baguio, Laoag and Rosales, the September 2018 LET will be administered in Bacolod, Cagayan de Oro (CDO), Catarman (Northern Samar), Cebu, Davao, General Santos, Iloilo, Legaspi, Lucena, Manila, Tacloban, Tuguegarao, Pagadian and Zamboanga.